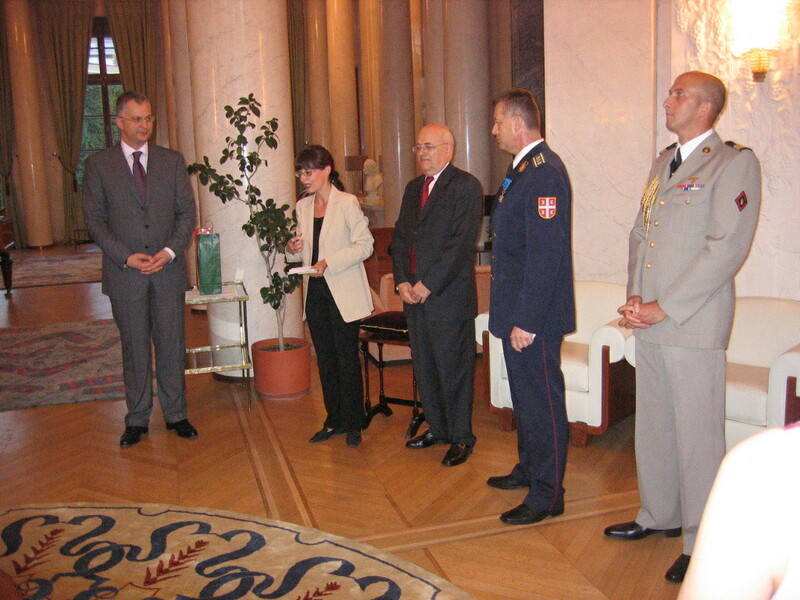 At the ceremony held at the French Embassy in Belgrade, the French Ambassador Jean Francois Terral handed Colonel Slavoljub Dabic, the Serbian Defence Attache in Paris (2005-2009) with a high decoration, which made Colonel Dabic the Officer of the National Order of Merit. The ceremony was attended by the Minister of Defence Dragan Sutanovac, the French Defence Attache in Belgrade, Lieutenant Colonel Pascal Michel Joseph Art, the representatives of the French Embassy and the Ministry of Defence of Serbia. While giving Colonel Dabic the high decoration, Ambassador Terral emphasized that Colonel Dabic had been the main initiator of rebuilding the relations between Serbia and France in the area of defence, "showing he is always available for performing numerous hard tasks". "He was able to quickly realize contacts necessary for the development of our military cooperation, making himself responsible for missions on the territory he was accredited for, in France. An energetic person and a diplomat, with excellent fluency in French, Colonel Dabic is especially appreciated for his sense of making contacts, for his ability to listen to his collocutors and maintaining his contacts with the French authorities", said Ambassador Terral, marking the work of Colonel Dabic in the military diplomatic mission as commendable, because he "committed himself completely, thus creating a highly evaluated image of his armed forces and country". "Taking into consideration the exceptional quality of the tasks performed within the development of trust between the Armed Forces of Serbia and France, and due to the fact that I have had a chance to meet him on several occasions and that I appreciate him both as a person and an officer, I am especially pleased to name Colonel Slavoljub Dabic the Officer of the National Order of Merit", stressed the French Ambassador Jean Francois Terral, handing the decoration to the Defence Attache in France who spent four years performing this function, and who was now finishing his General Staff improvement in the School of National Defence.